I've been rewatching Game of Thrones and have noticed that everytime someone is offered milk of the poppy they refuse it, If memory doesn't fail me, some examples would be: King Robert, Jaime Lannister and Maester Luwin. Why do characters refuse milk of the poppy? I thought it was some form of anesthetic? Does it have nasty side-effects? Can it make you die? Or is it just to make the characters look tough? In the book, several characters do accept milk of the poppy. No less a person than Eddard Stark takes it, after he's attacked by Jaime Lannister in King's Landing towards the middle of A Game of Thrones. I do remember several times in the books when characters refuse it, often because they need to have their heads clear for some reason. I think the show creates the perception that everyone is always turning it down because when people take it in the books, it's usually mentioned in the narration; in the show, that all gets cut because it's not that important to the plot. "Milk of the Poppy" is simply a more ornate way of saying any opiate-based pain reliever in the G.R.R. Martin novels and televised adaptation of Game of Thrones. 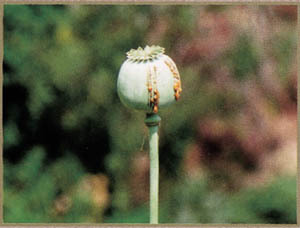 As seen in this image below, the poppy flower will produce a capsule that is scored, and drained of its "milk", the opiate gum, that will be rendered down to produce heroin, hence the name "milk of the poppy". Just before reaching maturity, the poppy plant produces a flower. After about a week, the flower petals fall off, leaving a capsule. Raw opium gum is harvested from this capsule. The surface of the capsule is cut, or "scored," with a knife containing three or four small blades, and the opium gum oozes out through these cuts. The next day, the farmer scrapes the gum off the capsules with a flat tool called a scraper. Each capsule is usually scored in this manner three to five times, or until scoring produces no more gum. Poppyfields contain thousands of poppy capsules, so harvesting is very labor intensive. Once the gum is collected, the farmer sets it out to dry for several days, then wraps it in banana leaf or plastic. The gum is stored until a trader comes to the village--opium gum has a very long shelf life and can gain value over time. After the harvesting process is complete, the capsules are cut from the stem, allowed to dry, then broken open so that the seeds inside the capsule can be used for next year's crop. And like any opiate-based pain-reliever, "milk of the poppy" has several side-effects based on its use including dependence, memory-loss, and potentially lethal overdose. It makes sense only people down on their luck, with little left to lose, would accept it and its consequences long-term. People who valued mental clarity, if they were familiar with the side effects, would likely not risk any potential benefit seeing how many people fell to its many side-effects. Opiate-based pain relievers came in a number of varieties on Earth including heroin, morphine, tinctures of opium and Laudanum. Considering such pain relievers were over various periods used to treat a variety of illnesses. As one researcher has noted: "To understand the popularity of a medicine that eased -- even if only temporarily -- coughing, diarrhoea and pain, one only has to consider the living conditions at the time". In the 1850s, "cholera and dysentery regularly ripped through communities, its victims often dying from debilitating diarrhoea", and dropsy, consumption, ague and rheumatism were all too common. -- “In the Arms of Morpheus: The Tragic History of Laudanum, Morphine, and Patent Medicines”, by Barbara Hodgson. Buffalo, New York, USA. Firefly Books, 2001, pages 44-49. Opiate-based pain relievers have been experimented with heavily on Earth, since the 16th century but the growth of poppies and their derivatives have been used since before the birth of Christ. It is conceivable the lands of Westeros have had a similar long-term relationship with such opiate-derived drugs and have experience with their potential deleterious side effects as well as a part of the culture. To be fair the differences between the books and the movies indicate there are users of the Milk of the Poppy depending on what events are taking place. The televised version seems more averse to it, possibly an issue with the censors. Milk of the Poppy indeed helps with the pain but it has very dire side effects if taken over a long period. It can distress the patient with disturbing dreams. It can dull the mind of the in-taker to an incapacitating effect. It can affect appearance of the in-taker's face i.e. making it puffy. Body may develop tolerance of the medicine, thus requiring even bigger doses with that much more side effects. It can undermine efficiency of certain anti-infection medicines. I shall not walk that road again. The King was completely incapacitated due to MOP and regency passed to his rash brother Aemond, who made a string of mistakes which resulted in fall of King's Landing, Arrest of Queen Mother and Queen Consort, Death of Queen Consort and near-arrest of the King along with his Children. Aegon did not wish to let it happen ever again. Rhaenyra Targaryen took milk of the poppy after stillborn birth of her daughter Visenya. King Aegon II took milk of the poppy after his battle with Princess Rhaenys 'Queen who never was' Targaryen. Lord Balon Greyjoy's father, Lord Quellon Greyjoy used to take milk of the poppy for his stomach aches during his old age every night. Milk of the Poppy was administered to Jon Arryn by Grand Maester Pycelle. Eddard Stark was given milk of the Poppy by Grand Maester Pycelle. Robert Baratheon took milk of the poppy after dictating his will to Eddard Stark. Jon Snow was given milk of the poppy by Maester Aemon after his fight against Wights in Lord Commander's Tower. Lord Hoster Tully was given Milk of the poppy by Maester Vyman for his stomach aches. Tyrion Lannister was given milk of the poppy after his injuries in Battle of Blackwater Bay. Prince Doran Martell takes milk of the poppy to dull his gout induced pain. Gregor Cleagane used to take a lot of MOP for his injuries taken against Prince Oberyn Martell. Quentyn Martell was given MOP by Missandei after he got burnt by Dragons. Khal Drogo drank poppy wine despite being warned of its impacts on anti-biotic treatment he had received for his wound. The wound festered as a result and Khal died. Jaime Lannister refused milk of the poppy however it was not due to fear of side-effects. Jaime was afraid that Qyburn would cut his whole arm if he let himself be knocked out by MOP. King Aegon II refused another MOP treatment when he sustained new injuries against Baela Targaryen. King was determined not to walk that road again and lived rest of his life in pain. Tyrion Lannister refused further treatment on milk of the poppy after Blackwater Bay. Prince Doran Martell refused milk of the poppy once before meeting his nieces as he wanted to keep a clear head in the meeting given sinister reputation of his nieces. Gregor Cleagane used to drink milk of poppy like other people drink ale. This made him both dependent on and tolerant of milk of the poppy. So as you can see, there is only once instance of a character refusing to take Milk of the poppy without ever have taken it before. That's Jaime. is plagued by blinding headaches and oft quaffs the milk of the poppy as lesser men quaff ale. Of course, Gregor is a "frothing dog" rather than a man who might actually want to have a clear head from time to time such as Ned Stark or Tyrion. There are a range of opiate (poppy derived) pain killers with varying strengths and addictivemess. They have sedative effects, and also suppress the breathing reflex and slow gut action. The issue with opiates is that many of them when taken by mouth are knocked out by an enzyme in your liver called cytochrome P450 before they can get to the rest of your body. Those that are eliminated in this first pass metabolism are classified as having low oral bioavailability. An example of this is heroin which must be injected. Other opiates have higher oral bioavailability and can be swallowed eg methadone, codeine, endone. Westeros as a pre industrial culture would have had a fairly primitive method of refining poppy sap- the drug produced would have been a crude mixture of opiate compounds . It certainly would have properties of pain killer but the correct amount to take would vary from plant to plant, region to region, season to season, even between the people who prepared the extract. so the side effects of mental sedation or unconsciousness , breathing suppression, intestinal paralysis, could not be predicted and were a very real risk. The simple reason is trust yes its addictive being opium and clear heads are important in got. If you think The most rememberal person not taking milk of the poppy is Jaime that is because he is in the north where Lord Bolton is known to be with the Starks at the time no one knows of there deal with the Lannisters just yet but also the master has his chain striped of him. If your from the south that's enough reason in its self not to trust. Why does every injured person in Game of Thrones refuse Milk of the Poppy? Why does Melisandre want to sacrifice Gendry?